The Wall Sport Journal: Manchester United's IPO: A Masterstroke? A business student's take on the world of sport. 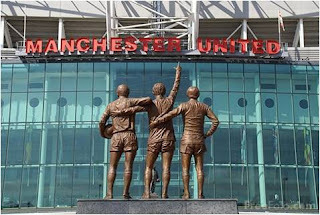 Manchester United's IPO: A Masterstroke? 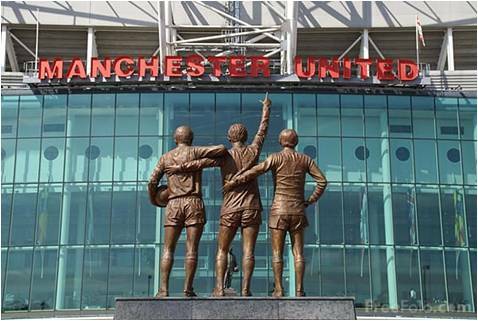 Manchester United announced its first quarter financial results on Wednesday (November 14). United’s decision to go public and launch an IPO seems to have the desired effect at least for the short-term. As per the club, they are well poised to hit their promised financial targets. 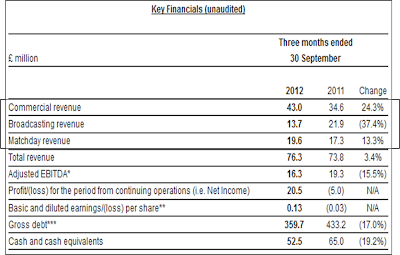 For the financial year 2013 Manchester United expects to earn revenue in the region of 350 to 360 million pounds. The equity generated from the shares sold after being listed on the NYSE has helped reduce their debt down to 360 million pounds (572$ million). The club has been under debt since Glazer’s purchase of the football club. The IPO has been successful in bringing the debt down and would allow precious funds to be re-invested into the football club. United’s summer recruits especially Robin Van Persie have begun the season well and have successfully navigated to the knockout stages of the Champions League. In 2011, United made it to the finals of the competition and received over 80 million pounds in revenue. Their failure to make it beyond the group stage last year resulted in a huge revenue loss, almost to the tune of an overwhelming 65 million pounds. The pertinent question is whether the United can sustain its value on the share market. Most market analysts are of the opinion that Manchester United’s (MANU) shares shouldn’t be touched with a bargepole. Historically, sporting enterprises have usually performed below the market. The last sports club to go public in the United States was the baseball club, the Cleveland Indians. The Cleveland Indians opened in 1998, priced at $15 per share and when current owner decided to take over the team, the shareholders were paid $22.63. 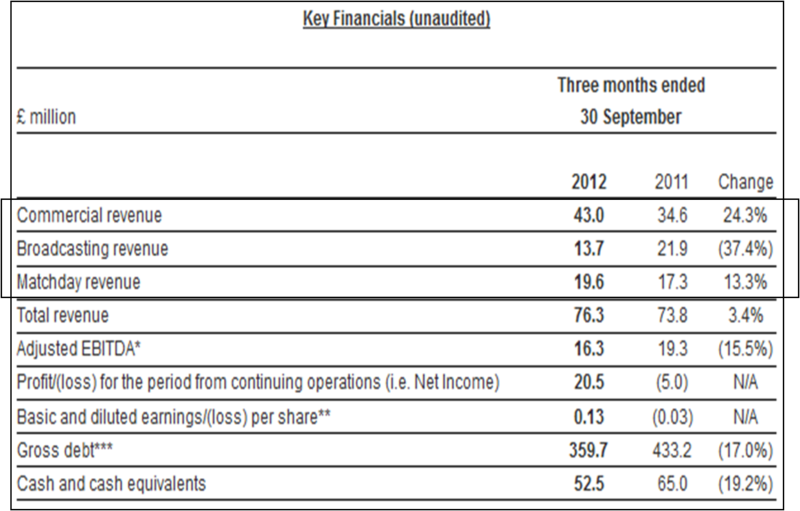 The improvement in share price was more than 50% of the initial price. But this was far less than the growth shown by the NASDAQ Composite index, which grew by 124%. Also, the owners of the club have ensured that the shares released out to the public have less voting rights. The owners hold “Class B” shares which carry 10 times more voting power than the “Class A” category farmed out to the public. Manchester United hoped to sell its shares for $16 to $20 but its shares went public at $14 per share at a valuation of $2.3 billion. Furthermore, the share price has not been able to generate any sort of frenzy and the reaction has been relatively lukewarm. Since the time it has been launched fellow sports entity Madison Square Garden, owner of both New York Knicks and New York Rangers, has performed far better than United during the same time period, as shown in the graph above. For United to increase shareholder value, they have to increase their commercial revenue because revenue from both Broadcasting and Matchday usually evens out during the course of the season. As a sign of intent, Manchester United have gone on a sponsor signing spree including a deal with American auto giant General Motors (GM) worth $559 million. The United team will be sporting the car brand Chevrolet from the 2013/14 season. United have also confidently decided to buy back the training kit deal they had in place with DHL for $64 million because they felt they could negotiate a better deal with other sponsors. Also, following Shinji Kagawa’s arrival at United, Japan’s biggest export to the premiership since Nakata’s stint at Bolton, has seen a spate of Japanese sponsors queuing up. In the short term the decision to go public seems a good one as it has injected much needed funds to reduce debt and make it more competitive. United’s worldwide fan base of 650 million is its biggest strength and there would be no shortage of sponsors across the world. There will be pressure though to maintain their business model as well as sustain their performances on the pitch. As last season’s results suggest Manchester United are no longer the top dogs of either the country or Manchester. It won’t be an easy fight but as United’s history suggests they always like to do things the hard way. Good Read. Shrewd signing Kagawa with the departure of Park to keep its popularity in Asia going. Thanks Vatsa. That's a very valid observation.